There is a saying very popular in Pakistan that Pakistani people could not live without watching tv & it is reality. Today everyone love to watch tv even most of people obtain sleep very late. With the passage of time television technology has been very advanced. Few years before there was a single tv channel in Pakistan which called as PTV yet today people watch hundreds of tv channels with new technology which called as Cable Tv Network. Cable tv network is a paid network where people have to pay up to Rs. 500 for a month. According to the economy condition of Pakistan it is not reachable for everyone. Therefore most of Pakistani people still watch PTV (Pakistan Television) because its a free channel & there is no need to pay any fee. But today I am sharing with you a very significant information. Which will provide you free Tv channels Even you can watch up to 150 tv channels. It is not a scam. Today most of people do not have information approximately satellite channels (Dish Antenna). They consider that dish antenna channels or satellite channels could not be watched without paid card. But it is not true. You can watch up to 150 to 200 Pakistani & Indian free channels through satellite or Dish antenna & there are total up to 1000 free worldwide channels are available. Couple of years before Dish antenna or satellite channels are very popular in Pakistan yet today people consider that this technology is no more available & we can not watch satellite tv channels now. 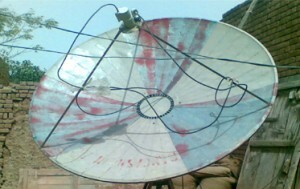 Even there are many new channels are available on satellite or dish antenna. Actually Pakistani people have many questions about dish antenna or satellite channels which will be answered at below. You can moreover post your question in below comments field of this post. What things are required for free satellite tv channels ? First question which raise in the mind of our people that is “what things required to watch free satellite tv channels” ? So you required a digital satellite receiver. It is little bit different to old (Analog) satellite receivers. There are many kind of china made receivers are available in Pakistani markets. But it is pertinent to mention here that some digital receivers are Restricted HD which means you can not watch HD channels & some Digital receivers have full HD functions which provide you full HD channels singles. So beware & only buy a full HD digital receiver I prefer “Star Treck” Model ST-2015 Galaxy II it is full HD receiver & price of this digital receiver is moreover very low. The market price of full HD receiver is only Rs. 3000 to Rs. 3500. Second thing which is required for installing satellite system is LNB. There are two types (Frequencies) of LNB’s are available in markets. First one is C Band LNB & Second one is KU band LNB. C Band LNB is popular for Indian & Pakistani channels & If you want to watch worldwide channels then your required KU Band LNB. KU Band LNB is moreover required for some Indian channels So you I suggest you both frequencies LNB’s. You can buy both types of LNB’s in a very low rate. C Band LNB price is only Rs. 1300 to Rs. 1500. This type of LNB’s called as Single Solution. You can moreover buy Simple C Band LNB its price is only Rs. 500. But this type of LNB’s have so many problems. So I suggest you Single Solution C Band LNB. Euro Star is one of the best product in market for C Band LNB’s. If you want to increase your channels then you should moreover buy a KU Band LNB. You can moreover use both type of LNB’s with a Single Satellite. KU Band LNB price is moreover very low. Its market price is only Rs. 350 to Rs. 450. According to my experience Tokyo Sat is one of the best KU Band LNB product in Pakistani markets. For using two LNB’s with one satellite you need a two LNB’s Feedhorn. It provides you two LNB’s using option. Feedhorn price is only Rs. 200 to Rs. 250. Now you just need a Dish (Satellite). It is available in different sizes. But most of people use 7 feet single plate dish. It is a best option for watching 150 above free Pakistani & Indian tv channels. You can moreover buy fiber glass satellite dish it is second option for you. Adjustment of the KU Band & C Band LNB’s can be seen in picture above. Now you just need a Desq Switch which automatically convert your LNB C Band to KU Band. Desq Switch market price is only Rs. 70 to Rs. 100. Now your free channels are ready to watch. Good information but I am a female then How can I install this system on my house roof ? Is any expert available in your team ? We do not deal satellite dishes or installation deeds. But you can contact to your nearest electric market and I hope you would find an expert easily. I really want to thank you…. Kindly post updated rates of 2015 also let me know any one who provide all this services via call on delivery in islamabad/ rwp if yest please let me know his number. Can we watch all the channels of AsiaSat7, IntelSat20 and PakSat-1R with one dish? Please mail me your contact information i want to buy your services with firstly i need to ask some things. read your free dish channels watching formula. Yes an expert dish technician have all the knowledge which we shared here in this article. There is no issue of roof or ground area of a house. A satellite dish only required open area for the transferring singles from satellite to LNB. how to check that LNB is C-band or Ku-Band???? KU band LNB has small size than C-Band LNB. Even you can read at the top front of the LNB that is c-band or ku band. I live in Shad Bagh Area Lahore and am interested in Dish Antenna installation on the grounds, you have already mentioned above. I shall appreciate if suitable package information indicating, price, number of channels etc. is provided to me. Thanks and best regards. Prices of the all equipment have already mentioned in this article. Its depends on you that you have wish to watch ku band channels or c band channels even you can watch both LNB channels on single satellite. Kindly send me Contact number of the shop or technician . & total cost of 6 fit dish. AsiaSat 3S Pakistani Channels List. I have Satellite dish anteena’s availble from 2 feet to 6 feet and price starting from 5000 to 20000.This price include dish receaver,anteena etc. Rawalpindi wale contact kr skte ha and All pakistan shipping bhi available ha on buyer risk and cost. email me for further detail on adilroman25@gmail.com. At a time we can watch only one Satellite transmission like from AsiaSat07, IntelSat20, Panamsat etc, right?? From where can I find a complete list of satellite transmissions and channels covered by each ? Yes you can watch single satellite channels at a time. But most of satellites are very close to each other so you can get both satellite singles with two different LNB at a same time.